Cherubs Cafe is an extremely popular breakfast and lunch restaurant on Main Street in downtown Belmont. Starting this past Monday the cafe closed for the month for renovations. The cafe has been closed in the past for shorter amounts of time to complete updates like painting and cleaning but this is the first time it will be closed for major renovations. Everything from the kitchen to the dining room to the furnishings will be receiving a complete upgrade. 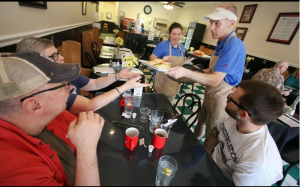 The cafe has been a staple in Belmont for the last 21 years and is run by Holy Angels, a nonprofit group devoted to providing creative learning programs and living opportunities for children and adults with intellectual or developmental disabilities. The servers and wait staff at Cherub Cafe are made up of these adults. The cost of the renovations will be covered partially by Holy Angels as well as donated grants and company discounts. A representative from Holy Angels has said that the cafe will be receiving a complete makeover that she hopes customers will enjoy when the cafe reopens in about a month. For anyone concerned about the well-loved menu at the cafe, it has been stated that the menu will remain mostly the same.